Our photos are all in artificial light and may have a colour cast. The Quorn looks better in reality! 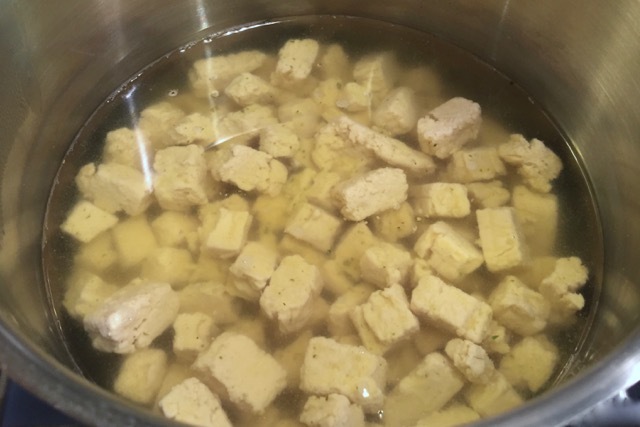 The chunks come frozen and require cooking directly from frozen. There are a couple of generous servings in a bag, that could easily stretch to serve 3 or 4 depending on the recipe. The one thing we find odd is that the pieces must be cooked 'in a sauce' for 20 minutes. This does make them less versatile, especially if you're not making a sauce. For our stir-fry we cooked the chunks in a light vegetable stock first, then drained them. They only need 15 minutes simmer time like this. Once cooked the pieces do look a whole lot like pieces of chicken, although they're quite small. Probably a good size for chicken and mushroom pie, but we didn't have the energy or pastry skills for that! The texture is very meaty with strands of mycoprotein. 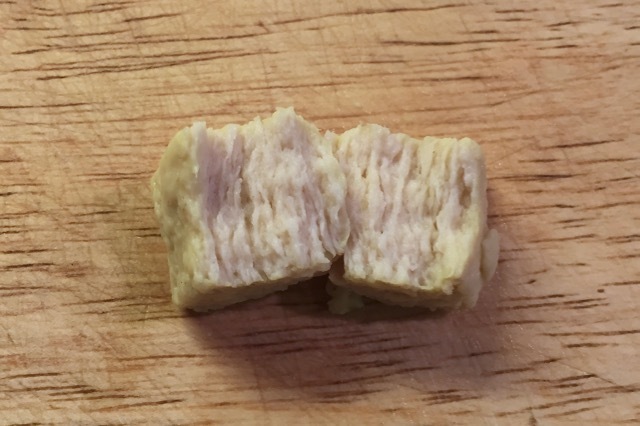 The pieces are quite soft when cooked in stock though, which gives them less bite, which isn't ideal. The pieces have very little flavour, with just a little mushroomy background flavour. This isn't great if you want to highlight the chunks in a stir-fry, unless you can really pack in the flavour from elsewhere. For our review we went easy on the seasoning so we could taste the Quorn, but you should aim to add plenty yourself. For the next dish we aimed to make a thai curry. This presented the difficulty of following the Quorn instructions (simmer for 20 minutes) or the sauce instructions (just 5 minutes required). 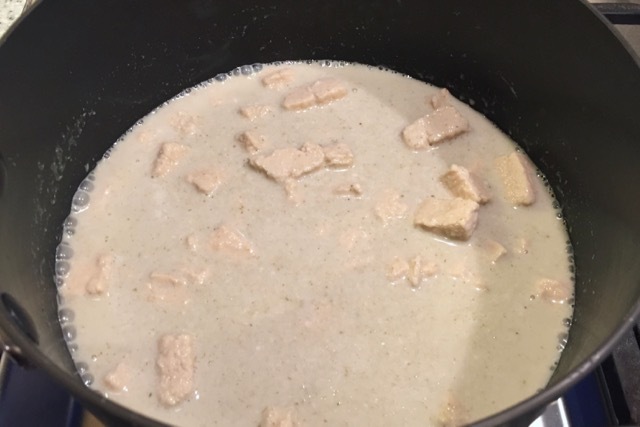 We ended up simmering the chunks in a mix of coconut milk with curry paste for 20 minutes. This isn't ideal as the coconut milk separated after so long. The Quorn pieces worked better in the curry than in the stir-fry as they had more bite, and the sauce gave them plenty of flavour. 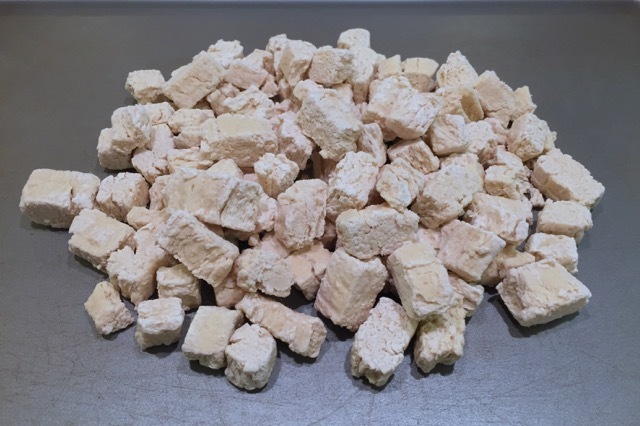 We can imagine that these chunks could prove useful if you've recently turned vegan and want to adapt an old recipe that uses chicken. After being wowed by the chicken-style burgers, the meat-free pieces had a lot to live up to. They're good, and certainly as good as other alternatives on the market, but they don't have the wow factor. We particularly want to stress that the cooking instructions are not ideal, and being able to defrost and just warm these through would be preferable to the requirement to simmer for 20 minutes in a sauce. 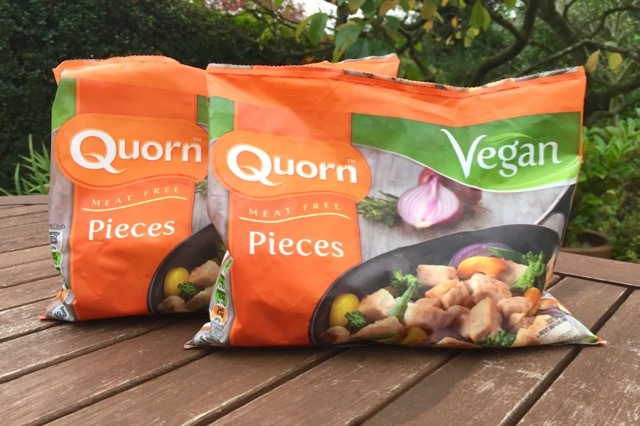 You can find Quorn Vegan Pieces in Waitrose and Asda, or you can buy online from Ocado. That link is for the chilled eggy Quorn by the look of it. 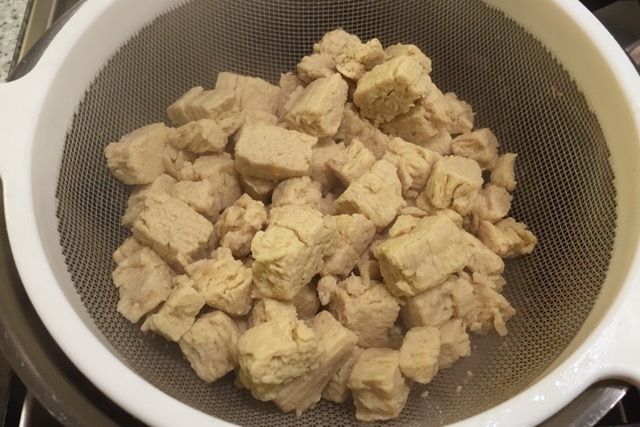 You can't marinate frozen chunks. This is getting a little frustrating now. The eggy and eggless varieties are the same. You cook them the same way. The eggy variety also comes as frozen, and also comes with identical 'simmer for 20 mins' instructions on the back. That link is for all recipes that are anything to do with quorn chicken pieces. ?! Why would you cook them in stock?! the instructions are clearly on the assumption that you'll be using them in pasta, curries etc. If you were using any other product you wouldn't substitute sauce for stock boiling. Well, because we wanted to pre-cook them to use them in a stir-fry which seems not unreasonable. They don't need any pre-cooking, you can just as you wanted to defrost and warm through. 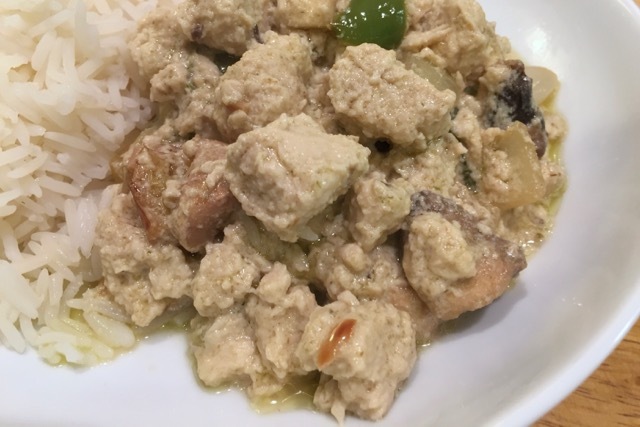 In the case of the Thai curry, you could have stir fried with the paste before adding the coconut milk. For the stir fry, just stir fried, e.g. https://youtu.be/_sHlNBsGxF4 (vegan/vegetarian both have the same cooking instructions). They don't need any kind of special treatment, there's no requirement to simmer, that's just an example of what to do if you're cooking something like a curry or pasta sauce. They should have included other examples in the instructions too, that would have avoided the confusion. Ian, we always follow the pack instructions as best we can when reviewing. If there are no defrost instructions (which there aren't) we can't follow them. Most people won't Google alternative instructions, especially as there are over 100 Quorn products, some chilled some frozen. No, you didn't follow pack instructions at all. Pack instructions were to cook in sauce, not to boil in stock before stir frying, which is just ludicrous. Granted the back instructions are not helpful, but seriously? They aren't pieces of dried TVP. 'if there are no defrost instructions we can't follow them' - you make no sense. You won't defrost because it doesn't tell you to, yet you're perfectly happy to boil in stock then stir fry, even though it most definitely did not tell you to do that. And trashed the product as a result. Perhaps when reviewing you should stick to your work and give a rating based on following the instructions, not based on some soggy ruined mush resulting from your own ridiculous invention of how to cook it. I know my tone sounds pretty confrontational.. it's because everyone else seems to be managing just fine with it (including comments on the quorn facebook page from people making stir fries), and I've been cooking with the regular version for getting on for 20 years, I've never come across something as stupid as boiling it in stock, I'm honestly flabbergasted. It would take all of two seconds of typing 'quorn chicken pieces stir fry recipe' into google to get a ton of suggestions on how to do it. Great some Quorn products are finally vegan :-) As gave them up due to milk & egg in their products. So hope to seena change over for more products soon! P.S I microwave the qourn pieces first usually. Either use to make a dish after that. Or fry them in a bit of olive oil & maybe some herbs,spices& or seasoning to add texture & flavour. Then add to a dish being made. Looks like microwave is a good idea. We didn't do it in case it made them chewy. I think the instructions to simmer is meaning that is the cooking time, I've just chucked them from frozen into a curry sauce or a stir fry, and in fact 20 mins I believe is max cooking time, as when i used them in a curry they did tend to feel they were about to fall apart as they had been cooking for more like 30 mins. I just threw them in with a stir-fry and they cooked fine. I liked them, the texture is difficult to describe: they're denser than tofu, softer than tempeh but not as chewy as seitan. If they were cheaper and widely available, which hopefully they will be in future, I would buy them regularly. Tried them a couple of days ago. Easy to use but disappointed by the background flavour of fish. I'd echo the observation that they're more fishy than chicken-y, but I don't mind. Have you heard that they've just released a third vegan product - fillets? These are great for all sorts of uses, not quite as the now discontinued Releat Chicken, but still good. Never defrost these and chuck them into whatever you're cooking direct from freezer - they do not take 20 mins to cook, it's less than half that...just try a piece before serving and enjoy! I thought maybe I got the fish taste cause I was pregnant! I couldn't finish the pieces in my dinner cause it was so gross! 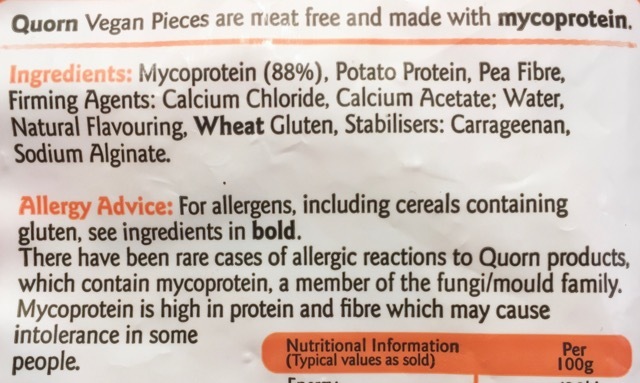 This is because Quorn is made from mycoprotein which approximately up to 5÷ of people are allergic to. 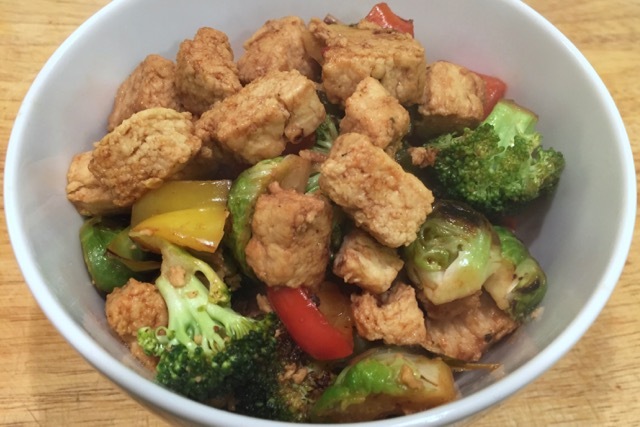 I have done some online research because my girlfriend had to throw up after eating various veggie foods in private and in restaurants - as it turns put all from Quorn based on this mycoprotein. So be careful! I am talking about serious Tours of throwing up and in two instances eben having to call in sick the next day! I was really keen to try these as I used to like the ordinary vegetarian Quorn pieces but these taste awful. An extreme fishy taste which is very unpleasant. I hope their other vegan products are better than these. I do what I used to do with the non vegan quorn. Put what I need on a plate& put it in the micro wave for a bit so defrosted & cooked a bit. If going in a pasta dish I saute the pieces first in a frying oan with oluve oil,seasoning, herbs,spices. Then eiither mix into sauce for a bit. Or pile on top of the pasta & sauce. For stirfrys micro wave as before if want it a bit crispy stir fry first then put back in to warm through with rest of stirfry. Or if would like the pieces a bit softer add once veg has stirfried a bit. I bought these a year ago during Lent to avoid dairy. The fish flavour was there and I didn't buy another bag until this week. I assume the fish flavour was due to seaweed but don't see that on the ingredients. Unsure what causes it. This time round I cooked in a curry and hid whatever flavour in the sauce. It would be interesting to learn what causes the seafood taste others are experiencing too.